The OGC WMS (Web Map Server) standard specifies the interface and parameters to dynamically request maps from a server. Every OGC WMS is individually configured and can serve a multitude of different maps, combination of layers and can optionally even be styled with different cartography. The "Capabilities" document contains all information needed to intelligently request maps from the server. In simple words: Get maps! Depending on the configuration of the server maps can come in a variety of formats, sizes, coordinate and projection systems. The following examples show the same map data at different scales and in different coordinate systems. Maps can be structured into "layers" and the server can offer to apply filters to select or highlight specific features. The OGC WMS standard offers a great many options limited only by your data and your creativity. This demo server hosts street data. The images show how the topography is overlayed with infrastructure, points of interests and finally some text notes. The combination of all layers shows a regular map. Additionally you can overlay map data from other sources which can even come from different and remote providers. The result is onyl visualized in your client (for example any desktop GIS or web map client). The OGC WMS standard is used to retrieve Online maps via the Internet (http). Maps can be linked from a web site, navigated with a professional GIS client, or used on mobile devices. 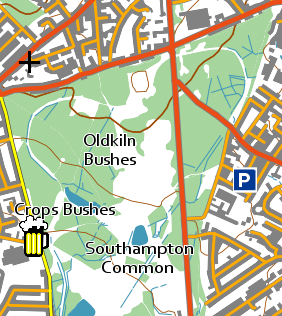 Any application that needs map images can use the OGC WMS standard to get maps. And because it is a widely accepted industry standard almost any map generating or using software can "speak" OGC WMS allowing to combine maps from several sources regardless of the underlying software implementation. The OGC WMS standard is mature. It has been adopted by ISO and is an integral component of many national and international regulations and directives. The first version was released in 2001, the current stable version 1.3 has been released in 2006 and is implemented by several hundred software products. The GetCapabilities request returns a document in XML format which contains all information a client needs to make a GetMap request. Use this link: GetCapabilities document from the OGC WMS Demo and Reference Server. The GetMap request returns an image files of the requested map. In case the server cannot answer the request an error message is returned. This error message is either formatted as an image of the same size as the requested map or as an XML string. Use the link: GetMap to retrieve the map image form the OGC Demo and Reference Server. It will be rendered dynamically each time you request the image (given that no proxy interferes and delivers an earlier graphic rendition of the map data). The OGC WMS Demo and Reference Server is an external resource which can be used to test a live and compliant implementation of the OGC WMS standard. Every standard of the OGC is complemented, referenced or used by other OGC standards. The following list gives an overview of the most related standards. OGC WMTS (Web Map Tile Service): For heavy use and high scalability the OGC has developed the WMTS service standard. It is an area-wide collection of consistently addressable seamless map image tiles organized in a pyramid with fixed scales. Clients request as many tiles as needed to cover the requested area. OGC WFS (Web Feature Service): The WFS service standard returns geographical features like points, lines and polygons in a geographical file format. OGC GML (Geographic Markup Language): Geographical XML file format to encode complex features like points, lines and polygons, and collections thereof. OGC KML (Keyhole Markup Language): Geographical XML file format to encode features like points, lines and polygons, includes styling information. GeoJSON. Serialized geographical file format to encode simple features like points, lines and polygons ignoring coordinate system specifics.